Large corporations have been doing wellness programs in the workplace for decades. Small and medium-sized companies have started to offer wellness programs. The most recent RAND Employer Survey reveals how roughly half of small and medium sized companies still do not offer any wellness services. 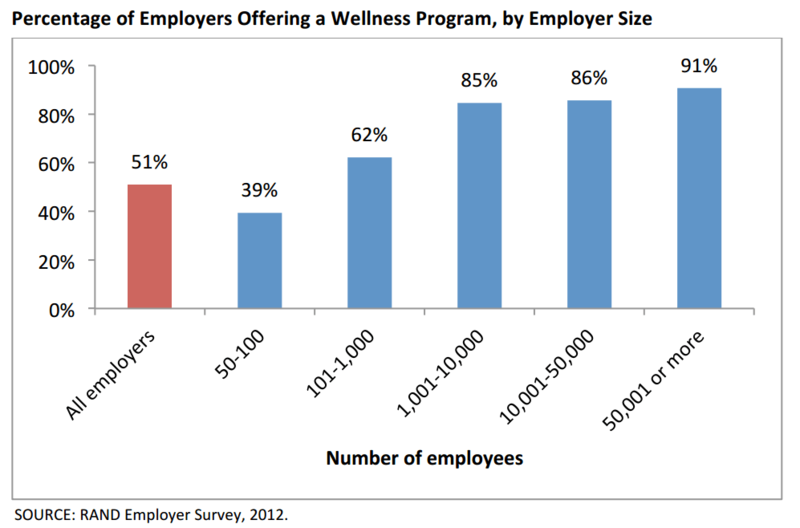 But even these data overestimate the prevalence of wellness programs in the workplace since the survey classified wellness program participation as “at least one phone or email contact with the wellness program.” That’s perhaps the worst definition of participation I’ve ever heard. Regardless of the results of the RAND survey, when I ask brokers what percentage of their book of business is doing a decent job of workplace wellness programming, the answer is always about the same: around 10%. That suggests that here, in the real world, around 90% of small and mid-sized companies are doing little or nothing regarding workplace wellness. In addition to providing guidance on health insurance products, brokers are now being asked for advice on how to start wellness programs in the workplace. Whether they accept this role or not, brokers have been thrust into the added role of wellness consultant. Several years ago WellSteps started surveying brokers to see what kind of advice and counseling they were offering employers. This survey data was combined with broker surveys conducted by the LinkedIn group: Wellness is a Business Strategy. Together, these data reveal four main approaches to workplace wellness that brokers are using to stay competitive, grow their business, and add value. These surveys generated many different responses but we were able to cluster them into four main approaches. The purpose of this article is to carefully review the pros and cons of each approach and help brokers decide what is the best way to help clients offer an effective workplace wellness program. Below is a short list of the pros and cons of the Do Nothing approach. Even though this is the most popular approach brokers are taking to workplace wellness it does nothing to help employers solve their challenges with poor employee health and rampant healthcare costs. 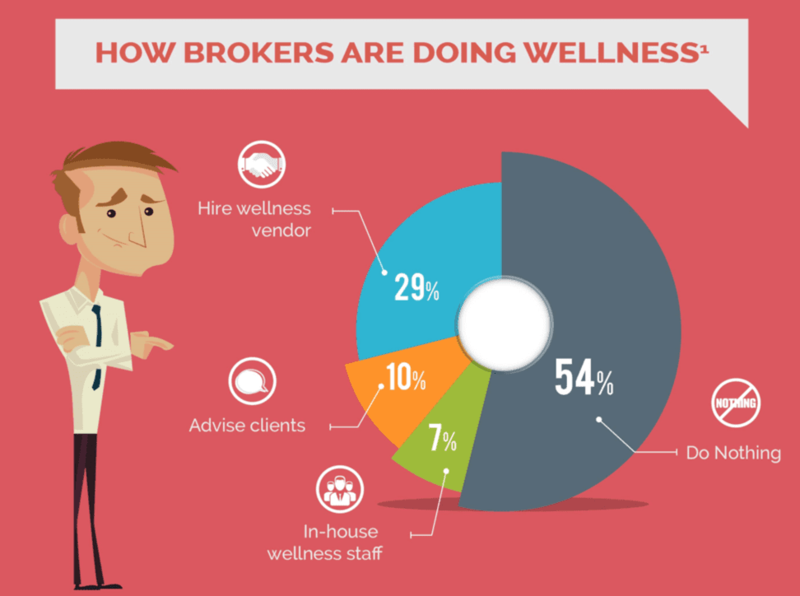 About 7% of brokers reported that their firm had hired a wellness specialist to help provide wellness services to clients. Typically, a brokerage firm will have one individual who is tasked to help multiple accounts with their wellness efforts. This individual may schedule biometric screenings, arrange for flu shots, distribute a health risk appraisal or offer a fitness challenge. In this arrangement, one individual is required to provide wellness support for a large number of clients. This allows the firm to market its wellness services against firms that do not provide such services. Hiring an internal wellness professional is a great way to provide limited wellness services to a large number of clients. The downside is that none of these programs are comprehensive. Instead they are sporadic, one-time wellness events that are not part of any comprehensive, long-term strategy. They make for great marketing benefits, but lack the substance needed to really produce meaningful wellness outcomes. They are akin to having a workplace safety program that consists of a once-a-year discussion about safety. The In-House Wellness approach may help some people gain health awareness, but there is no published scientific evidence that it can reduce elevated health risks, improve health behaviors or lower employee-related expenses. That doesn’t necessarily mean that this approach can’t produce any results, it simply means that there is no peer-reviewed evidence to show that it does. If employers are interested in starting a workplace wellness program as a strategy to improve employee health and reduce employee-related expenses, then this approach will likely lead to disappointment. Brokers that start advising clients on matters of wellness stop working as brokers and start acting as consultants. The problem here is that brokers get paid with commissions while consultants get paid by the hour. So, in order to take on a consultant role, brokers have to start providing services and assistance for which they do not get paid. Some may fear that this will lead to “service creep” as clients start requiring more and more assistance without additional pay. Brokers who advise clients about wellness become trusted advisors. About 10% of brokers take this approach and thereby are able to build relationships, strengthen current contracts, and differentiate themselves from others. On the other hand, this approach may require some wellness training. This training can come from additional schooling, certifications and personal study. Our FREE WellSteps webinars offer some of the best workplace wellness content available. One look at our list of registrants always reveals a host of consultants and brokers working to boost their understanding of wellness programming. Kudos to them for working to become more knowledgeable and effective advisers. If you can make the transition from commission-based broker to trusted adviser, you stand a better chance of maintaining and cultivating new business. WellSteps is a wellness vendor, so, of course, I’m biased toward this approach. But hear me out. There are plenty of good wellness vendors out there. The challenge is to sort through the marketing hype to find the ones who know what they are doing. A wellness program that has published evidence that it can produce wellness outcomes and is based on behavior change will be most effective. Once the right vendor has been selected, you will be able to create a partnership between yourself, your client and the vendor. When it works well, each party benefits. Your client will be pleased with the positive wellness outcomes it sees and you will have a competitive advantage that will help grow your business. Shifts responsibility to the employer and vendor Wellness is outsourced. Brokers have less control. Gets away from exclusivity, focus is on helping the employer (trust) Employers will be required to get serious about wellness. The list of pros and cons shown above will help you understand which approach is the best option for you to take, but there is another way to look at this decision. Pretend you are the CEO of a company and you are looking for a good broker and a successful wellness strategy. What would you like to see in this relationship? Below is an infographic that summarizes each of these options. Pass it along. Next PostWhy Offer a Wellness Program?